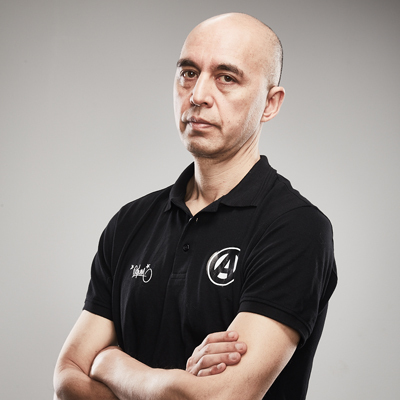 Phil Winram is an experienced basketball and business coach who merges expertise with enthusiasm, professionalism and vision. He has over 20+ years of experience in the leadership and development of highly functioning teams. As a basketball player, Phil has been privileged to be part of two professional teams in the Netherlands (DBL) and the UK (BBL). A classic “glue guy” who worked hard and inspired teammates to do the same. Phil continued to play basketball until he was 46 years old and has led teams to multiple league titles as a player and player/coach. Originally from Canada, he graduated from the University of British Columbia with a degree in engineering and a black belt in karate. Career performance with large international tech companies led to business leadership roles in the Middle East, United Kingdom and the Netherlands. He went on to found two companies focused on all mobile content development, one of which was awarded with the Deloitte Technology “Fast50” award (fastest 50 growing companies in the Benelux). More recently, he leads a digital marketing team in a large sportswear company. He has been an assistant coach with the Dutch 1st Division team Apollo Amsterdam for two years and in 2016 completed the Masters degree in Coaching program from the prestigious Johan Cruyff Institute in Amsterdam.